Montana currently has the twelfth highest percentage of employed people of disabilities (40.5 percent), compared with 77.7 percent of people without disabilities. View the rankings of all 50 states and compare. Geographically, Montana is in an employment hotspot for people with disabilities. It is bordered by Wyoming and the Dakotas, three states who have some of the highest rates of employment in the country for people with disabilities. This gives Montana the opportunity to closely communicate and collaborate with its neighbors to identify and employ best practices and improve outcomes for people with disabilities. Despite these positive numbers from Montana, the state will soon be undergoing a talent shortage and loss of employment as baby boomers retire and Montana’s economy evolves. There are almost 69,000 working-age people with disabilities in Montana and just under 60 percent of them are outside of the workforce. Many of those who are working are only working part time and/or are under-employed. A recent detailed study by the Kessler Foundation and the University of New Hampshire shows the 70 percent of working-age people with disabilities are striving for work. Furthermore, the gap in the labor force participation between people with and without disabilities is nearly 37.3 percent. While this is lower than 40 other states, this lack of employment for people with disabilities creates poverty, powerlessness and poor health. Polls and studies show that people with disabilities want the opportunity to have the dignity and independence that jobs provide. 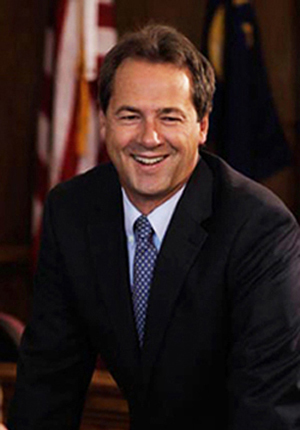 While Bullock did not answer each question individually, he sent a letter addressing several of the issues brought up in the questionnaire including employment, independent community living, veterans with disabilities, education, healthcare, caregivers support and workforce development. Thank you for the opportunity to share my thoughts about Montana’s future and this important issue. In Montana, you shouldn’t have to be a millionaire to enjoy the outdoors, get a good education, or be able to support your family. I understand this firsthand. I’ve led the fight to defend our public lands and public access rights. And, we’ve invested in public schools, helped make college more affordable, and balanced our budget while reducing taxes to help local businesses create more good-paying jobs. I have always opposed a state sales tax and have proposed a constitutional amendment to ban the sales tax forever. Greg Gianforte proposed creating a new sales tax in Montana, calling a new sales tax the quote “best solution” unquote for Montana – which would make Montanans pay more for everything from clothing to groceries, while proposing a plan to give massive new breaks to millionaires. All Montanans deserve the opportunity to live with dignity and contribute to their families and communities. During my first term, I’ve focused on building resources that help people with disabilities stay in their homes and communities, maintain independence, and prepare for and obtain employment. Sometimes the difference between being independent and productive at home and needing institutional care just means having access to basic assistance with daily activities; sometime it means getting more substantial in-home healthcare. There’s more work to do, but we’ve come a long way in the last four years. Disability and Employment Transitions. The Montana Department of Public Health and Human Services works hard to empower all Montanans with disabilities to prepare, obtain, and retain work in high-quality and high-demand careers. This work includes actively engaging in the states Workforce Innovation and Opportunity Act (WIOA) to reimagine the state’s vocational rehabilitation, independent living, and disability services to better serve Montanans with disability in living the lives they choose and deserve. Community First Choice Program. We were just the fourth state in the country to adopt the Community First Choice Program in Medicaid. Community First Choice provides long term supportive care in a home setting for people who would otherwise require institutional level of care. Our leadership on Community First Choice means that thousands of Montana seniors and people with disabilities are able to remain in their homes. The type of care available is tailored to each individual’s needs, living situation, and availability of caregivers. Services available through the program include activities of daily living like: bathing, dressing, grooming, eating, medication assistance, ambulation and exercising. Veterans Direct Home and Community Based Services Program. Montana is one of just ten states implementing the Veterans Direct Home and Community Based Services Under the program, veterans are given a flexible budget for services that can help them continue to live at home or in their community. Veterans are assisted by local Area Agencies on Aging in deciding for themselves what mix of services will best meet their personal care needs, hiring their own personal care aides (including family or neighbors) and purchasing items or services in order to live independently in the community. ABLE In 2015 Montana became the 10th state in the country to sign legislation creating tax free savings accounts for families to save for medical, educational, and other expenses related to caring for a loved on with a disability. Students with Disabilities. High-quality public education for all Montana students is the single most important investment we can make in Montana’s future. That is why I have made record investments in our public education system. I also have supported common­ sense legislation that would extend state funding to school districts continuing to educate individuals with disabilities after the age of 18 if they need additional time to earn their diploma. Unfortunately, our efforts have been thus far defeated by the legislature. Medicaid Expansion. At a time when partisan gridlock is paralyzing much of the nation, I’m proud to have passed the HELP Act in 2015, a bipartisan bill that expanded access to healthcare to tens of thousands of Montanans. We know that many of the people who now qualify for coverage under the HELP Act are individuals struggling with disabilities who may not yet qualify for Medicare or SSDI and home health care workers taking care of people with disabilities and until the HELP Act, couldn’t afford their own healthcare . We were able to get this important legislation passed because a bipartisan group oflegislators was willing to come together and work with me on a compromise solution that put Montanans’ health above political ideology and partisan bickering. Supporting Caregivers. We know that family caregivers provide 80% of all caregiving in the United States. In Montana, over 100,000 Montanans are helping to care for adult family members or friends, including people with disabilities. Our long-term care system is dependent on these family caregivers, many of whom are juggling work and caregiving . We also know that being a caregiver can be hard on your health, emotionally and physically. My administration has been working to make sure we coordinate and develop respite services for these family caregivers, and I recently announced that my next budget will include state funding for a respite voucher program that provides funding to caregivers who need financial assistance to arrange for a temporary break from their caregiving responsibilities. Healthcare Workforce Development. I’ve also been focused on making sure that we have the healthcare workforce necessary to care for our growing aging population, including seniors with disabilities. We’ve achieved unprecedented levels of cooperation between the Department of Labor, our colleges and universities, and the healthcare industry in this effort. What’s so exciting about all of this work is that it’s going to train our students of today for high-demand, high-wage work while also making sure we can meet the healthcare needs of their parents and grandparents as they age. For example, nearly 100 nursing and health faculty from Montana’s two-year and four-year colleges recently came together with Montana’s healthcare employers to completely redesign our state’s healthcare curriculum . This will lead to the creation of a common nursing curriculum at 8 two-year colleges, including 2 tribal colleges. The new curriculum will allow students to easily add degrees and credentials as they progress through their careers. We’re also increasing opportunities for on-the-job training by developing healthcare apprenticeships. For example, the Montana Department of Labor and Industry and the Office of the Commissioner of Higher Education are refining standards for specialty nurse aide apprenticeships in geriatrics and dementia care. We know that kind of specialty care is going to be so important in the coming years. Unfortunately, my opponent for governor in this elections cycle would thwart all of this progress by offering hundreds of millions of tax giveaways to out of state corporations and millionaires like himself. His proposal would decimate our state budget and impede our ability to invest in the services and supports that all Montanans expect and deserve to live full and productive lives in their communities.